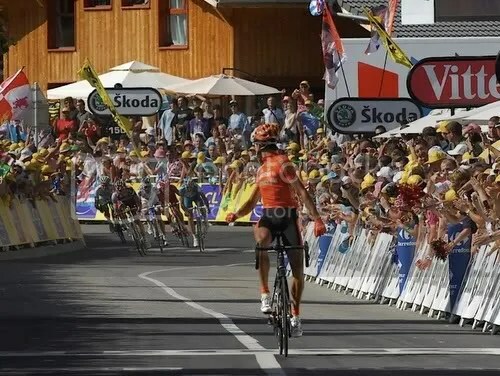 The climactic finish at any one of the Tour’s stages is always a delight to watch. The phenomenal speeds of the sprinters as they dash past the line in a blur, a solo breakaway finally rolling in to an appreciative crowd, or the one-on-one duels as 2 sprinters battle it out to the line with no quarters given … and, of course, the contrast of the ear-to-ear smiles of the victor and the downcast face of the 2nd place winner. 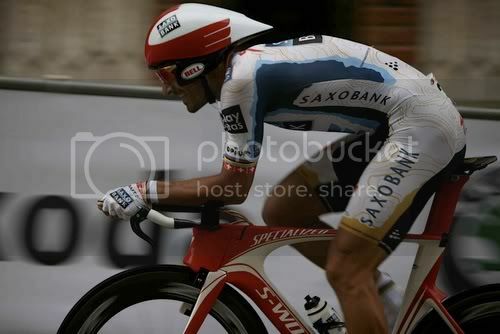 Stage 1: Fabian Cancellera easily won the prologue TT with his superb bike-handling skills on the descent, even though Contador clocked the fastest split at the first check-point. Cancellera would even overhaul this year's Giro winner, Dennis Menchov, himself no slouch at TTing, who started a minute ahead. 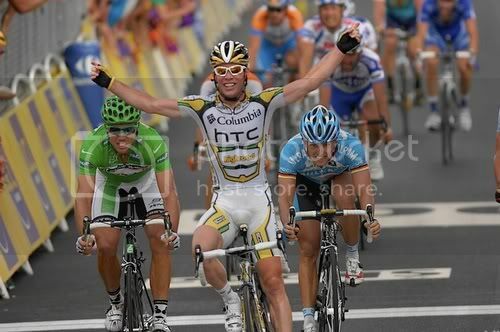 Stage 2: Mark Cavendish -- the peerless British sprinter on his way to a British record of 6 eventual stage wins. 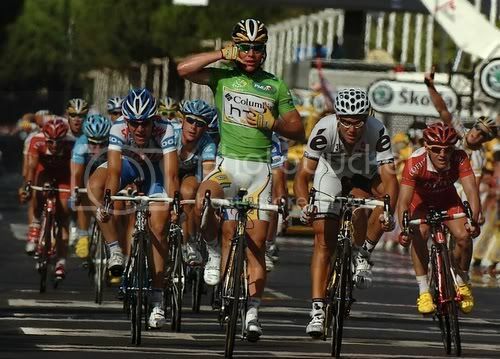 Stage 3: 'Hi Mom, yea...I just won the 3rd Stage. What? Oh, it was ok...nothing too strenuous' The Manx Express, Mark Cavendish, now in green, takes another stage and impresses upon HTC that they did the right thing sponsoring the team. 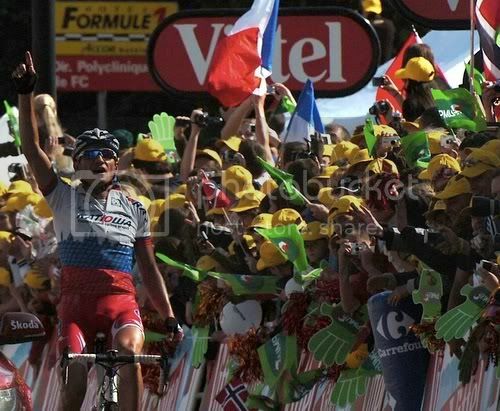 Stage 5: Tommy Voeckler solos in to his first ever TDF stage win, and a triumphant French victory, driving the partisan crowd wild with delight. Stage 6: A gritty Thor Hushovd from Cervelo Test Team triumphant after a wet, wet stage. 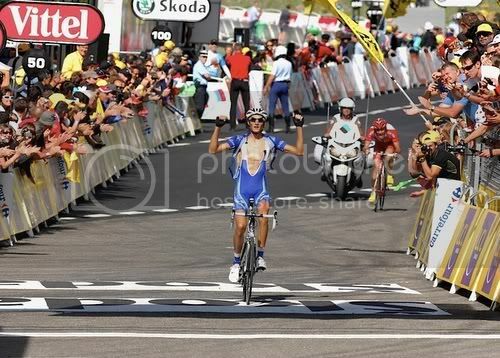 Stage 7: French win no 2 ... Brice Felliu, on his first pro showing, takes the stage victory for France. This guy is all skin and bones. 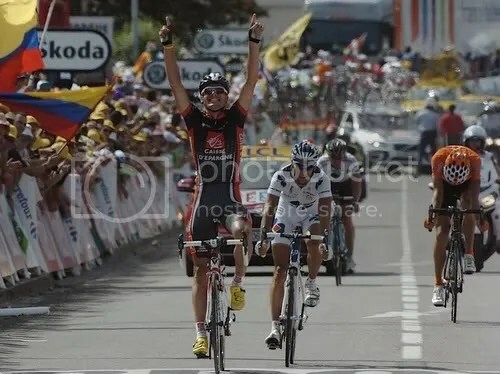 Stage 8: Breakaway specialist, Luis Leon Sanchez of Caisse d'Epargne wins the 4-man sprint in Saint Giron. Stage 9: Pierrick Fedrigo of BBox seems to be flapping his way to the line while Pellizoti, the eventual King of the Mountains winner, just can't hide his disappointment. Stage 10: Him again? 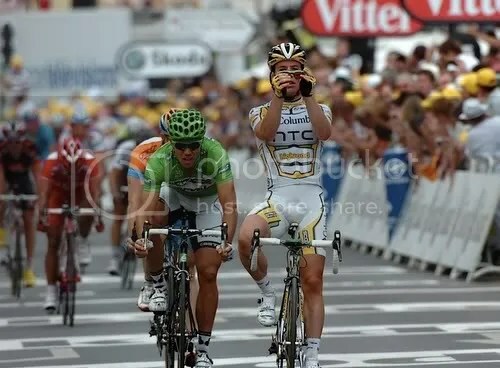 Mark Cavendish crossing the line and nonchalantly wipes his green glasses, sending a message to Thor Hushovd that he wants back the Green jersey. Stage 11: Cavendish yet again... getting to be a bit predictable, especially when the Columbia train starts sprinting away at the front, delivering Cavendish to the finish line in style. Stage 12: Wild with delight, Dane Nicki Sørensen finally chalks up a deserving win after 10 years as a pro. 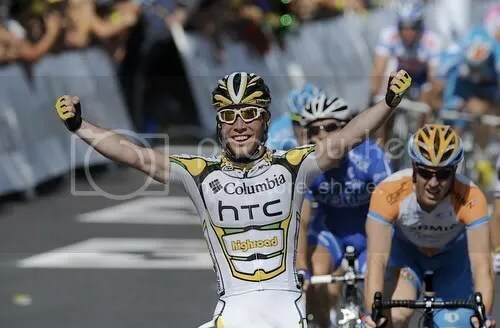 His win also pushed Saxo Bank to the top of the team classification. 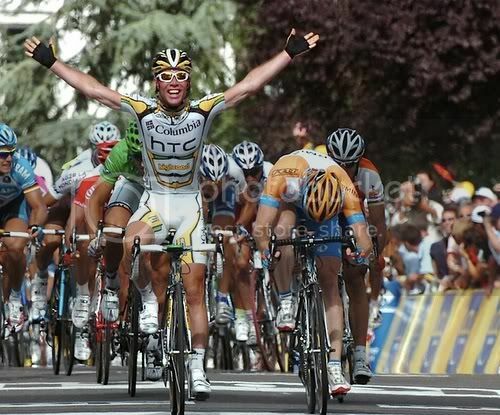 Stae 13: You would weep tears of joy too if you were Heinrich Haussler. It was the young Cervelo rider's first TDF stage victory, winning it in convincing fashion after an impressive solo breakaway. Stage 14: Katusha's Russian boy Sergie Ivanov is one-up on the peloton in stage 14 after a solo attack on an 11-man breakaway group. Stage 15: "'Bang, I got you". Alberto Contador with his trademark pistol salute, unleashes his climbing prowess, in the Swiss Alps, blowing away his rivals to take the yellow jersey. It was truly a commanding performance by this brilliant climber. and shouts for joy, taking the stage after a brave attack on the 8-man breakaway group, 3 km to the line. 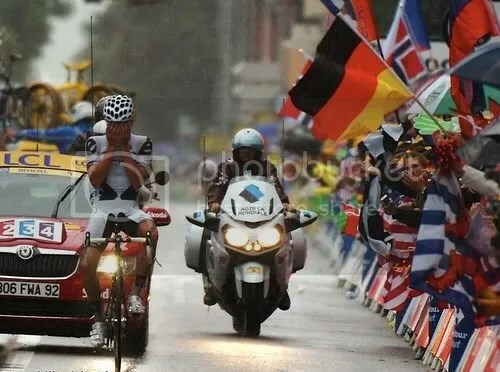 Stage 17: The Schleck brothers, Frank and Andy , make it a 1-2 finish ... Andy (behind Frank) seems to be saying with his hands that he's the #1 brother of the 2, which he eventually proved he was. Stage 18: Contador the Matador stamps his authority as a highly-competent all-round rider by taking the individual TT stage, frustrating Swiss champion and TT specialist Fabian Cancellera into 2nd place. Cancellera later claimed that Contador was 'helped' by the lead motorcycles. All I can say is, 'A win is a win'. 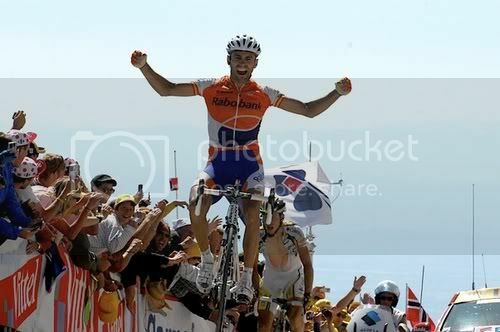 Stage 20: Rabobank finally salvages its pride when Juan Manuel Garate broke away with Columbia's Tony Martin, and beating him at the line for their only stage win of the tour at the spectacular Mt Ventoux. Stage 21 ""I wouldn't be able to live with myself if I hadn't won it after they did such a good job." Mark Cavendish takes his 6th stage win and pays tribute to his team, and the best lead-out man in the business, Mark Renshaw (in 2nd place behind him). After 3,459.5 kilometres, the maillot jaune on the shoulders of Alberto Contador crossed Paris' world-famous boulevard of the Champs Élysées. A celebratory glass of champagne seems to be in order. 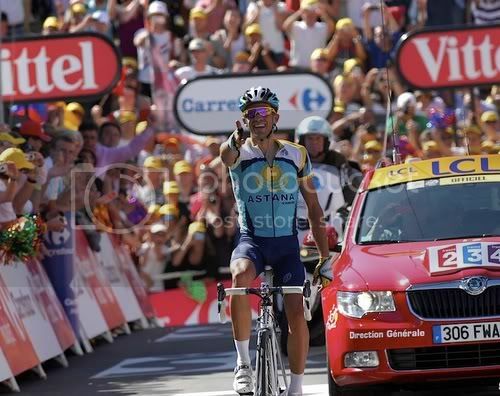 On the podium in Paris is every bike racer's dream but this year, Contador is the man. His customary pistol shot salute says it all. 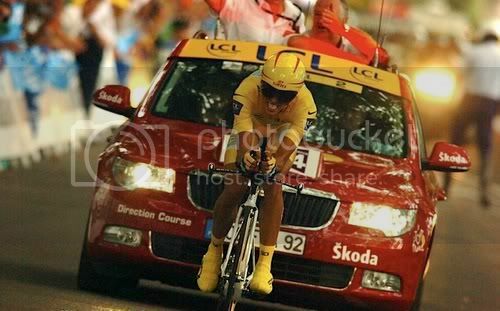 There were many casualties, among them, team-mate Lance Armstrong, of whom Contador later admitted to the press that he had zero respect for. All I can say is -- well said, Contador. ...... Lance Armstrong, the sore loser megalomaniac -- "Dude, I ain't going to your celebration party. So there." Here’s hoping next year’s tour will be even more exciting to watch — Contador likely to be in a new team bankrolled by Spanish compatriot, F1 driver Alonso Fernando, (and one that’s 100% behind him), Andy Schleck comes back more determined than ever to win yellow, and Lance will be riding under the Team Radioshack banner (with a new team that’s 110% behind him, never mind if they’re younger and better than him).